Bangladesh border guards destroyed at least 30 wooden fishing boats after they were intercepted Tuesday evening bringing more than 700 Rohingya Muslims across the river from Myanmar's westernmost Rakhine state. 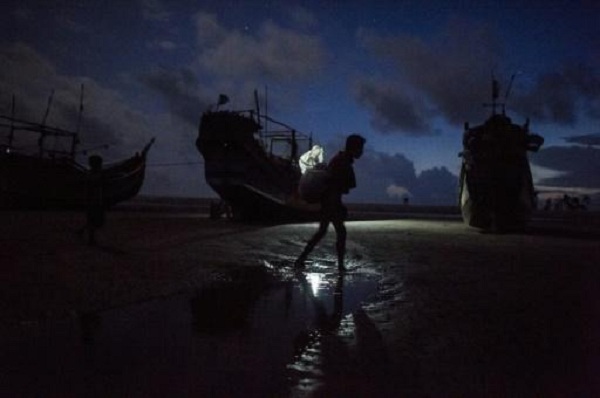 COX'S BAZAR (BANGLADESH) - Bangladesh has destroyed at least 30 wooden fishing boats to deter local captains from smuggling Rohingya refugees and illegal drugs across the border from strife-torn Myanmar, officials said Thursday. Border guards seized the vessels and arrested the captains after they were intercepted Tuesday evening bringing more than 700 Rohingya Muslims across the river from Myanmar's westernmost Rakhine state. The boatmen were also caught in possession of about 100,000 "yaba" pills, an illegal stimulant popular in Bangladesh, said a border guard official. More than half a million Rohingya have fled ethnic bloodshed in Rakhine since late August, many by boat across the Naf River which divides Myanmar and Bangladesh. "These brokers (boatmen) were smuggling people," one border guard told AFP on condition of anonymity because he was not authorised to speak to media. "We were asked to destroy the 30 boats. These are hand-pulled vessels, not run by engines", he added, saying non-motorised boats were used to avoid detection. A government official confirmed 39 people, mostly Rohingya living in Bangladesh, were jailed for six months for "excessively charging" refugees for passage across the Naf. "The BGB (Border Guard Bangladesh) has done an appropriate job," Zahid Siddique, a local magistrate and government administrator, told AFP. Gangs of boat owners, crew and fishermen have been charging the fleeing Rohingya upwards of $250 for the two-hour journey that normally costs no more than $5. Bangladesh's elite Rapid Action Battalion this week rescued 20 Rohingya being held hostage by local gangs demanding huge fares from the refugees. Some arriving in Shah Porir Dwip told AFP that boatmen had demanded they hand over gold, jewels and cash before taking them across. The boatmen are accused of not just trafficking people but drugs from Myanmar, with border guards discovering 100,000 "yaba" pills inside the seized vessels. The BGB officer said the drugs -- a blend of methamphetamine and caffeine popular among Bangladeshi youth -- were concealed inside the boats. Bangladeshi security forces have seized millions of yaba pills in recent years from traffickers attempting to smuggle the drugs through the border district of Cox's Bazar by land and sea from Myanmar. In the past fortnight at least five Rohingya men have been arrested on the Naf river in possession of 1.23 million yaba pills. Bangladesh has destroyed at least 30 wooden fishing boats to deter local captains from smuggling Rohingya refugees and illegal drugs across the border from strife-torn Myanmar, officials said Thursday.